All that was left after our afternoon snack! Today is cold, wet and miserable here in the back of beyond. The sky has been grey and the air full of drizzle, definitely a stay inside and snuggle day. But as it is a week day this can't happen, so I decided the young Vander-Cave and I needed something comforting when he came home from school today. I found in the fridge some leftover butter milk that I bought to make the Hummingbird bakery red velvet cupcakes. 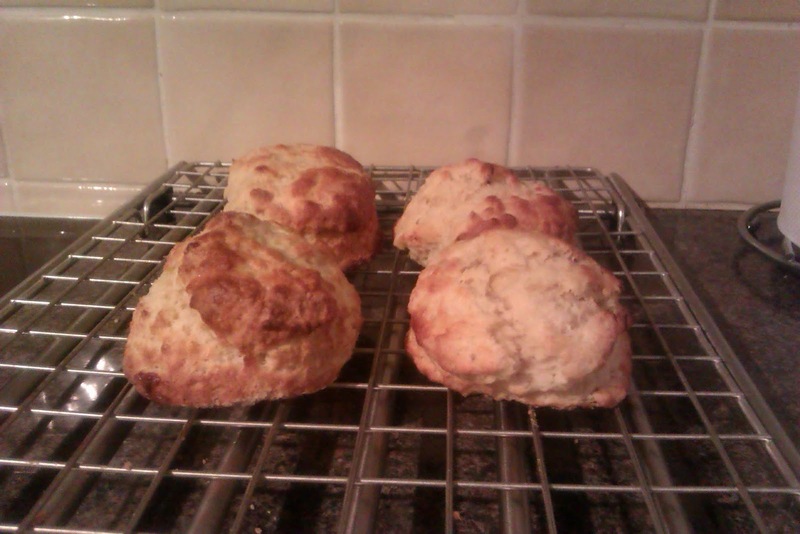 With the messages of " Love food hate waste" and "the average household wastes £680 a year on food that is thrown away" I decided to make scones. Cheap cheerful and divine when eaten fresh from the oven. Put the flour, salt and butter into a food processor and pulse until you can't feel any lumps of butter (or rub in butter with fingers). Pulse in the sugar. Gently warm the buttermilk (don't throw away the pot) and vanilla in a microwave or pan. Using your largest bowl, quickly tip in some of the flour mix, followed by some of the buttermilk mix, repeating until everything is in the bowl. Use a knife to quickly mix together to form a dough - don't over-mix it. Tip onto a floured surface and lightly bring together with your hands a couple of times. Press out gently (do not roll out) to about 4cm thick and stamp out rounds with a 6cm or 7cm cutter lightly dusted with flour. When cutting the scones out do not twist the cutter just cut straight downwards. Re-shape trimmings, until all the dough is used. Spread out on a lightly floured baking sheet or two. 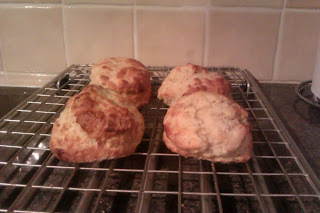 Add a splash of milk into the buttermilk pot, then use to glaze the top of each scone. Bake for 10-12 mins until golden and well risen. 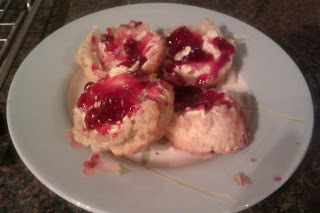 These scones came out beautifully although next time I think I will brush the top with beaten egg for a nicer finish.